him and the book briefly to Max. 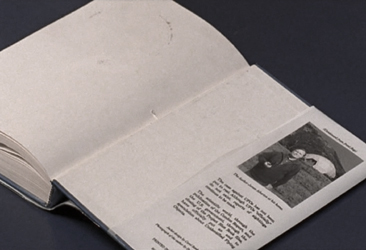 "James Atherton was the first to publish on the '47 crash. He authored several books, most notably 'Among Us' published in 1955." the mainstream,such that it is. But it may be of some interest to a true believer like yourself." 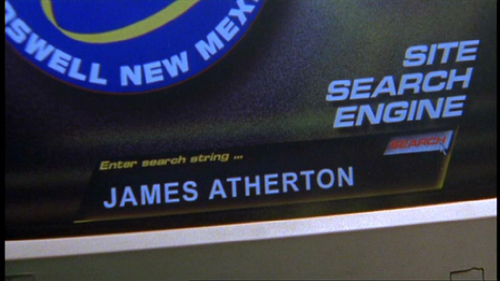 "Supposedly Atherton was on to something amazing, possibly direct contact. Legend has it that he was abducted by aliens because he disappeared in 1959." This is from the "Among Us" book, inside flap. The Author James Atherton at his home. Max quotes from the book to Michael and Isabel. "It's just Atherton. Listen to this. He says...this guy is nuts...that aliens wouldn't possess the lung capacity or brain capacity for more than short-term survival on Earth." 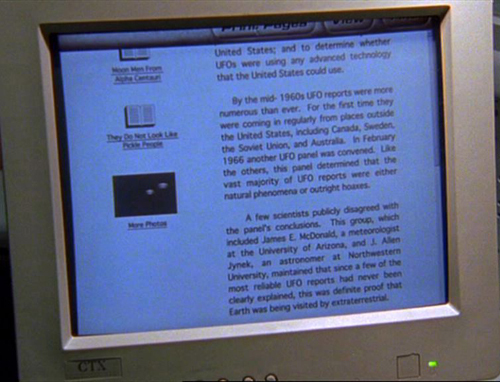 Michael breaks into the UFO Center to use the computer database to get more information about Atherton. This is what he finds. James Atherton was born from humble origins in East Pohawnee, Tennessee in 1911. Raised during a difficult time in America, Atherton watched as both WW1 and the depression tore his family apart. Taking solace in watching the skies, young Atherton impressed the astronomy department at East Pohawnee Technical Institute enough to gain a full scholarship and a new star watcher was born. 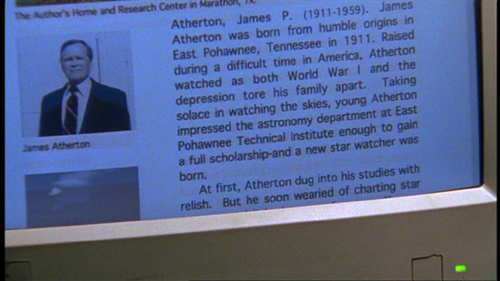 At first, Atherton dug into his studies with relish. But he soon wearied of charting star courses and light beams refracting off nova bursts. When his curiosity was peaked by the infamous 1927 Buffalo Visitation, he knew he had found his true calling: ET contact with this planet. 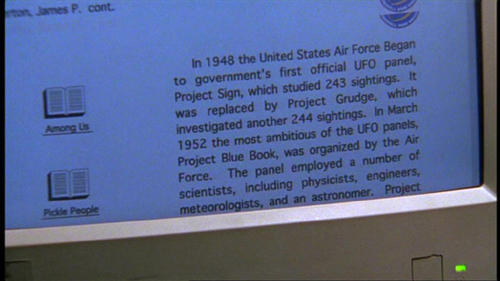 In 1948 the US airforce began the governments first official UFO panel, “Project Sign”, which studied 243 sightings. 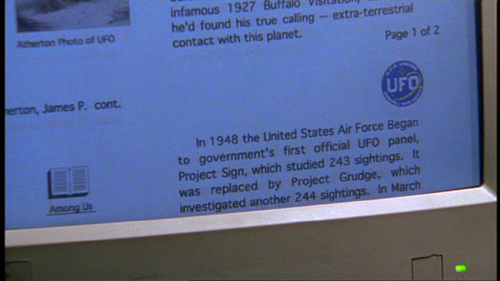 It was replaced by “Project Grudge” which investigated another 244 sightings. In March 1952 the most ambitious of the UFO panels, “Project Blue Book”, was organized by the air force. The panel employed a number of scientists, including physicists, engineers, meteorologists, and an astronomer. 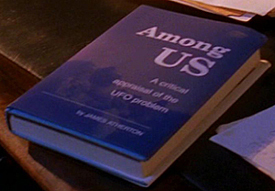 Project Blue Book had 3 main goals: to explain all reported sightings of UFO’s; to decided if posed a threat to the national security of the United States; and to determine whether UFO’s were using any advanced form of technology that the US could use. By the mid 1960’s, UFO reports were more numerous than ever. For the first time, they were coming in regularly from places outside the US including Canada, Sweden, Soviet Union, and Australia. In February 1966, another UFO panel was conviegned. Like the others, the panel determined that the vast majority of UFO reports were either natural phenomena or outright bogus. A few scientists publicly disagreed with the panels conclusions. 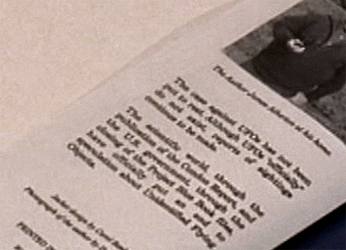 This group which included James E. Mcdonald, a meteorologist at the University of Arizona, and L. Albert Jyack and astronomer at Northwestern University, maintained that since a few of the most reliable UFO reports had never been clearly explained, this was definite proof that Earth was being visited by extraterrestrials. James Atherton somehow knew Nasedo and River Dog from the Mesiliko reservation. River Dog said Atherton was a friend of Nasedo. Nasedo trusted Atherton and gave him his necklace. But Atherton must have done something to endanger or betray Nasedo, because River Dog saw Nasedo kill Atherton. 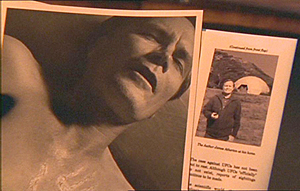 Atherton was the corpse with the silver handprint on the chest, in the photos that Valenti shows to Liz in the Pilot. The photo is marked Nov 16, 1959. 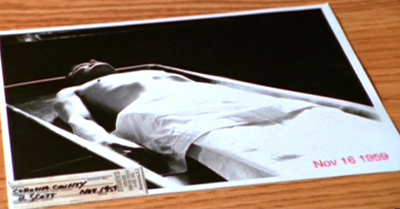 Valenti tells Liz that his father, also the Sheriff, discovered the body. Valenti also had a key recovered from the body. 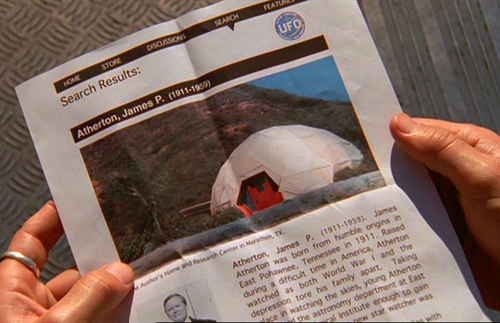 Michael stole the key from Valenti, and got the visions that led the pod squad to Atherton's geodesic dome in Marathon, Texas. 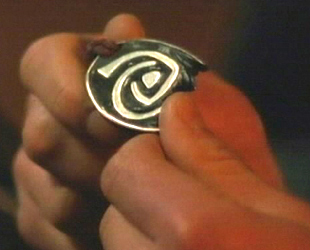 At Atherton's house, in a secret room in the basement, the gang finds files, and Isabel finds a pendant with an alien symbol on it. The gang takes the files but they aren't able to go through them before they are stolen by the Special Unit. In Topolsky's emails (on the SHP), she mentions looking through the files, but it seems likely nothing interesting was found in them since they were never brought up again. I'm betting that Nasedo destroyed anything that could have exposed him or gave any real information on him or the other aliens.